Description: Located just 20 minutes north of Port Douglas and positioned just metres from the sands, this unique address offers an enviable Far North Queensland lifestyle combining the benefits of acreage and waterfront living with over 300m of beach frontage. Taking pride of place on the block, the property features a modern single level home in prime position, built by locally acclaimed builder Shane Pratt and offering a high standard of living across almost 500m2 under roof. Designed to suit the extended family or those that love to welcome guests, there are a total of 5 bedrooms with the master enjoying a luxurious ensuite and large walk-in-robe, while the other 4 spacious bedrooms sit at the opposite wing. Offering high ceilings and cool, light tiles throughout, the home provides a number of living zones including a central enclosed patio with ample glass allowing residents to enjoy the sounds and views of the ocean in all weather. Also taking in the water view is the amply equipped kitchen, outfitted with stainless steel appliances (including dual ovens), central island bench, twinned fridges and walk-in pantry. Professionally landscaped, the main home also includes a neatly fenced yard to the front, providing a great space for children or pets. Complementing the home's 3 car remote lock-up garage, there is a detached shed with room for 3 vehicles and provision for power and water already in place as well as a fenced horse paddock for the equestrian-minded. Zoned rural, the balance land is comprised predominantly of level to gently sloping caneland though may be suitable for a wider range of pursuits. The property is connected to mains power and water, with additional bore water and NBN service available. Less than 90 minutes from the Cairns Airport, this property has all the makings of an idyllic lifestyle home. 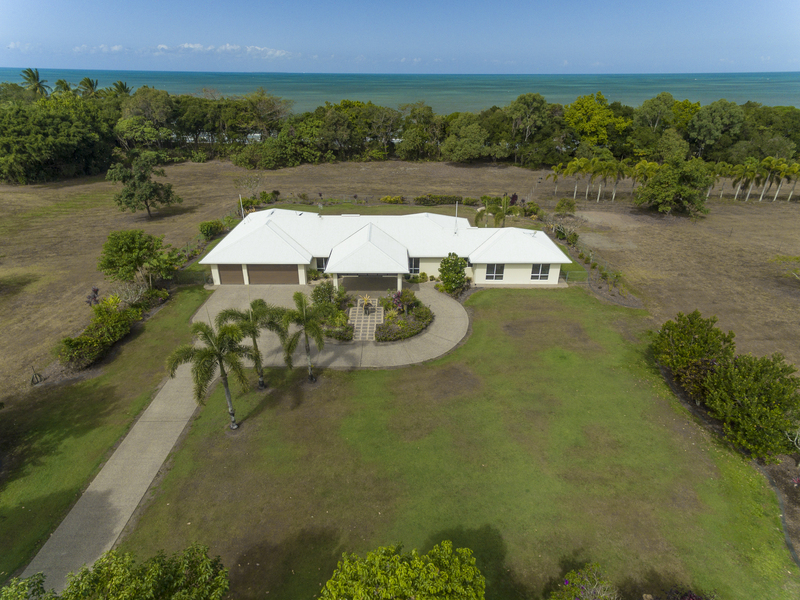 1168 Mossman-Daintree Road, Rocky Point is offered for sale at the listed price of $2,000,000. To arrange an inspection, contact Tom or Stacey Quaid at Colliers International. *measurements and boundaries approximate only.